I did this post over at my other blog, Captive Creativity, but I had to bring it over here to share with you all! Do you know about Air plants? I had never heard of them or even see them until I went with my mom to Shelmerdine’s here in Winnipeg on Monday. My friend Sara always tells me about all the great things she gets there so I had to finally go. It was garden heaven! Now I don’t have a garden yet, because well, as you likely know we aren’t in our house yet, but I have a sort of indoor garden with the amount of plants I have accumulated and it’s only going to get better! I resisted the urge to buy all of the air plants when I saw them (and my mom explained them to me) but I’m saving up (because they were anywhere from $7-$16 each) and I’m going to get a few when I’m all settled in. So me being the type of person that wants to know all the details here’s some information on these wonderful plants. Tillandsia are part of the Bromeliad family, the Genus name is Tillandsia which is also the common name, these are further broken down into species name, most people just call them Air plants. There are over 550 species of Tillandsia (plus many hybrids), that grow in the Mexico, South and Central Americas and there are only 16 species that are native of Florida. Tillandsias take all their water and nutrients through the leaf system, none or very minimal amounts are absorbed by the root system. This root system is used as wire like anchors to hold onto trees, rocks etc. Since the root system is not important to the plant this can be removed without harm, to make your plant easier to mount. The roots may or may not grow back, either way is doesn't matter to the welfare of your plant. Growth CycleBromeliad Tillandsia have a life cycle of one plant growing to maturity and blooming. Before, during or after blooming (depending on the species) your plant will start producing young (PUPS), most plants will produce between 2 - 8 pups which in turn will mature, generally within a year and in turn bloom and produce pups. So this year you have one plant, next year maybe 6, the next year 36 and so on. Your plant will actually look better next year than this year as it starts to clump and produce more blooms. The bad news is that each plant will only flower once in its lifetime, but you should have blooms each year as the pups mature, and in turn flower. Flowers can last from several days to many months, depending on the species, most Tillandsia bloom naturally in late winter through mid-summer. 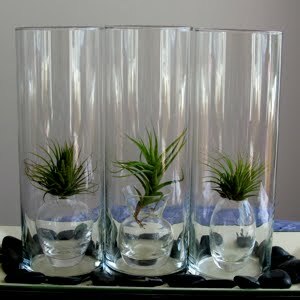 Tillandsias DO have to be watered, they live 'in' air, not 'on' air. Tillandsias are NOT toxic to animals, although this does not mean your pet won't eat them, but they will survive the experience, your plant might not. Tillandsias are NOT parasitic, they do not harm the host tree. Trim away brown, bent or damaged leaves, this will not hurt the plant. They were not initially cared for properly (their owner was told they need little or no water). They did not get enough light (they were more than 10 feet from a bright window or skylight). They were placed in DIRECT SUN. Garden windows are generally too warm unless they are shaded or facing north. Tillandsias growing outdoors need more watering than indoor Tillandsias, as the sun and wind dry them out more quickly.Pretty informative right? If you’re like me and really want to invest in these plants go to the source of this info and check out the watering instructions. What’s your favorate or dream exotic plant? 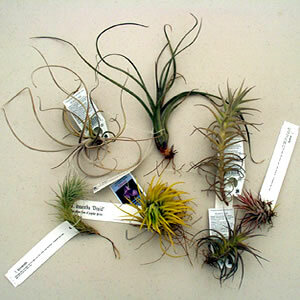 Note: I have found that the information below didn't work the best for my air plants. I few of them died and I was told (by the green house staff where I got them) that I over watered them. They suggested just misting them 3 times a week. When I say misty I am meaning similar to what they say below by getting a good amount of water on the plant. You can spray the top and bottom (roots) of the plant and let the water run into the plant along the "leaves" that way it is getting into the plant and can do it's work from there. Watering is one of the most important aspects of succeeding with Tillandsias, and one of the most misunderstood. Tillandsias NEED water, although they can survive for long periods of drought, they are NOT GROWING and certainly not thriving in these conditions, they are going dormant and just trying to survive. Your plant will also rot and die if left wet for too long. This means your plant wants water, but needs to dry out completely before being watered again. Plants should be given enough light and air circulation to dry in no longer than 4 hours after watering. It's best to water your plants in the morning so they dry by nightfall. Humidity is NOT a source of water for your plant. Tillandsias can only obtain their water if it is sat on their leaves, in nature through dew, fog and rain. Humidity only delays the drying process. Tillandsias are covered in suction scales (trichomes) which capture moisture, these scales automatically close when your plant has enough moisture. Get to know your plant, handle the leaves, after watering the leaves will feel stiff and full of water, when in need of water they will be softer to the touch and the plant will be lighter in color. Dehydration can be noticed by flaccid, wrinkled or rolled leaves. 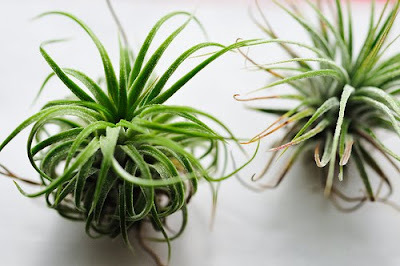 Generally speaking water quality is not important to Tillandsias, they do not tend to show water spots and are basically only susceptible to pH8 or higher, or too much salt. Artificially softened water has too much sodium (salt) for Tillandsias and should not be used as it will slowly cause die back. Distilled water is too pure and will actually pull nutrients out of the plant tissue causing death, NEVER use distilled water. 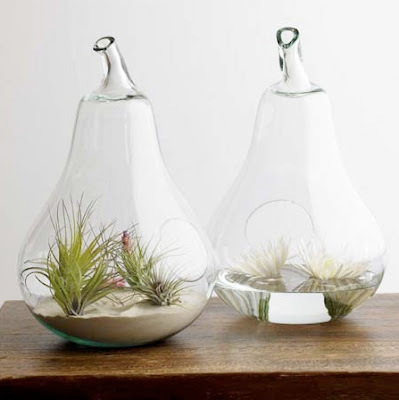 Tillandsia like moving air not closed stuffy conditions. Your plant needs to be watered regularly, at least 2 to 3 times per week. Misting is generally not sufficient even if done daily, they need to be watered (underneath as well as on top) to the point of runoff as though they've just gone through a rain storm, AT LEAST twice a week. The easiest way to achieve this is to actually immerse the whole plant in the sink or a bucket if possible, if not, use a hose or the kitchen faucet to totally wet your plant. Your plant will also appreciate a good soaking for several hours every one to two weeks (although never submerge the blooming flower for more than a few seconds, or the petals will dissolve, of course if you're going away for several weeks it is more important to give your plant sufficient water, than to the preserving of the bloom). 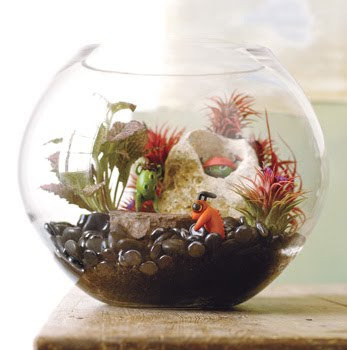 Shake off any excess water from fleshy plants. Give thin leaf varieties an extra spray on their tips as they dry out faster. For even more information check out these links! LOL! I love the tip at the end. I'm excited to see what you post on this new blog! Where to buy?! I love them! You can order them online, ebay, etsy, and then a lot of garden shops have them. 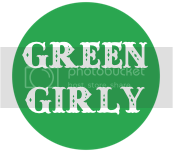 try a specialty shop in your area tho. in wpg you can get them at shelmerdean's.